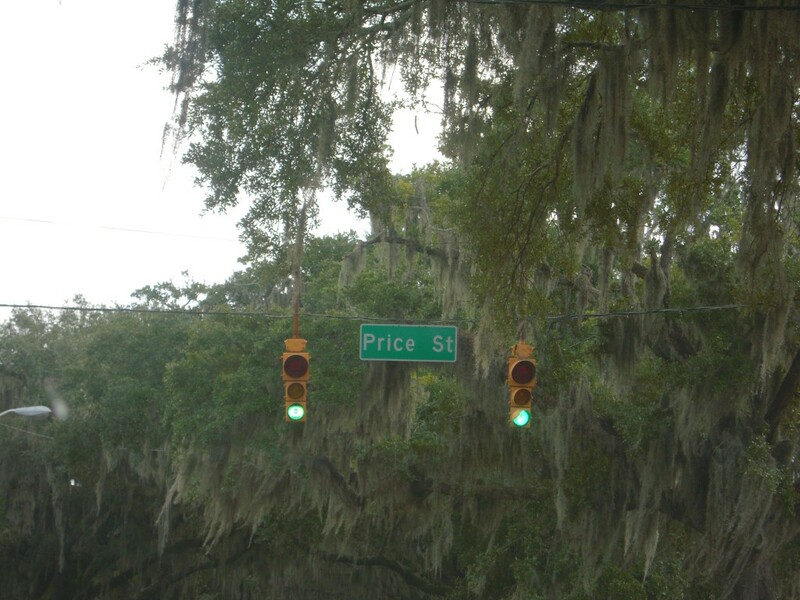 Last weekend I was in beautiful Savannah, GA for my dear friends wedding. It was a gorgeous elegant event, I had a blast, and I was honored to be a bridesmaid. The moss covered trees were something to see! I snagged this pic on my way in. It was a super fun and super busy weekend but I managed to squeeze a couple of store visits in and a riverboat ride on the Georgia Queen! My favorite stop this trip was Jekyll Island, GA. Absolutely gorgeous! I saw some creatures below, and also some great birds and even a dolphin! It was so quiet and serene. I explored over 200 miles of the coast this trip, mostly FL, meandering my way from beach to thrift store. Other stops included Tybee Island just east of Savannah, Flagler Beach, Jacksonville Beach, Anastasia State Park, a brief visit to the Kennedy Space center which ended since a rocket just got sent into space and the beach was closed (a rocket!) that doesn’t happen every day! 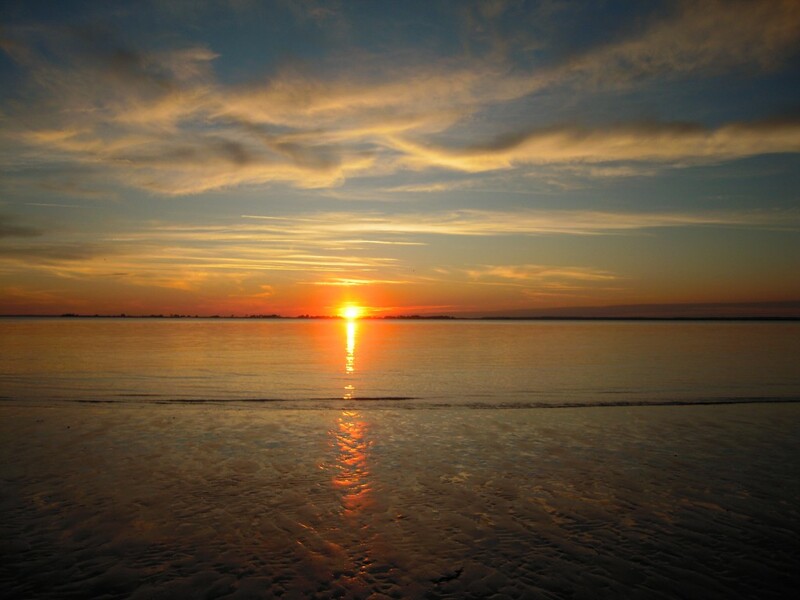 I also spent the night oceanside at Daytona Beach and my last day I spent soakin up the rays at Cocoa Beach. 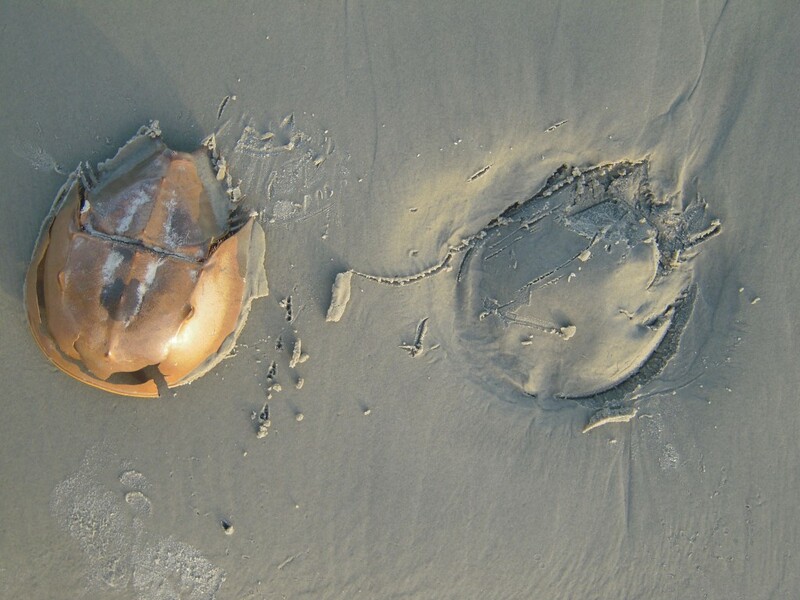 Along one of the beaches at Jekyll Island, there were tons of horseshoe crabs to be seen along the beach, more than I have ever seen in any one place and they were all huge! I took a ton of pics and ran around checking em out. So awesome, mysterious, and beautiful! What a sight! This is one of my faves! 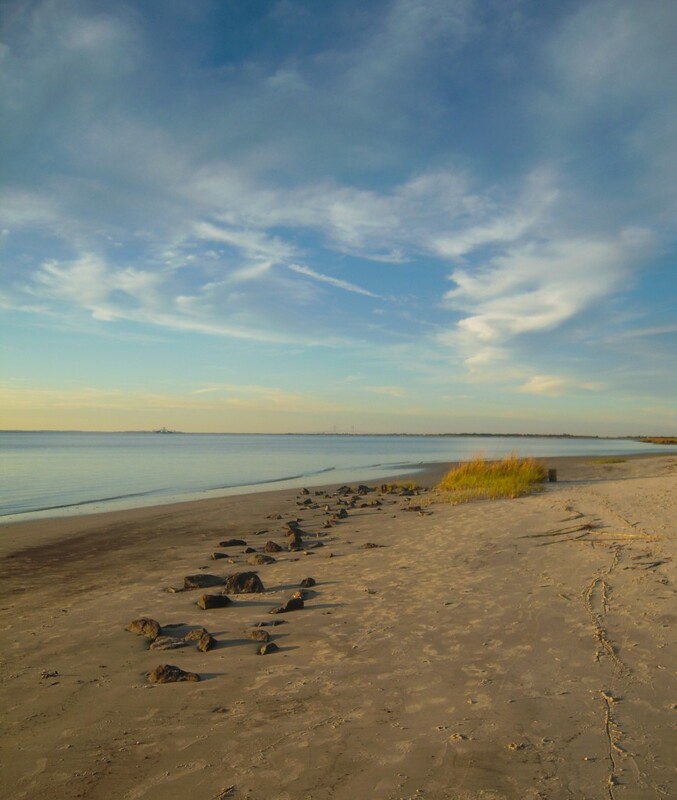 Another Jekyll Island creature sighting! 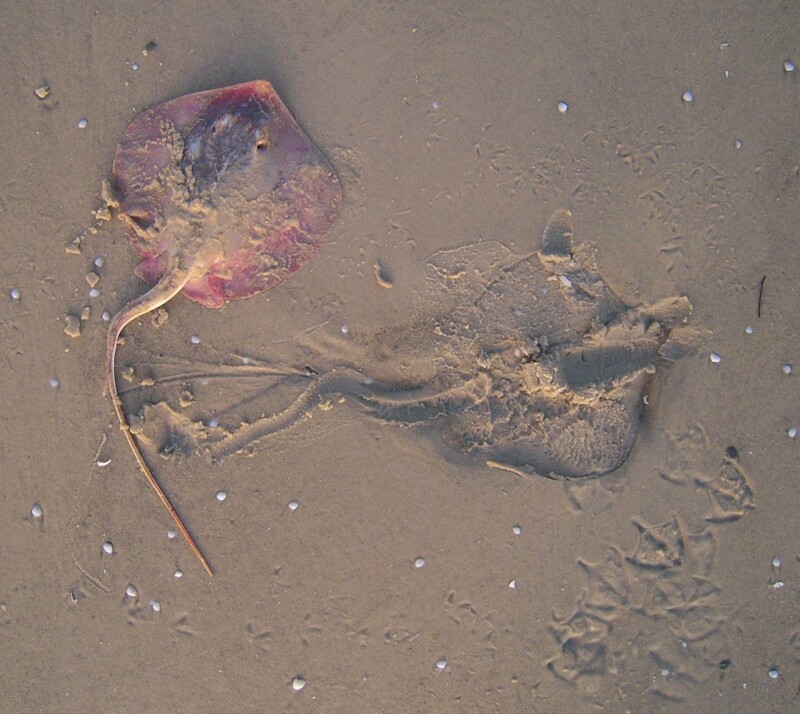 A pinky stingray!!! I love how you can see the imprint again and the bird footprints comin to check out the scene! Like all good things, my trip came to an end and I arrived back home this afternoon with loads of artgoodies work awaiting me. I managed to read a whole book while away- which I never have time to do, find some sweet vintage goodies available soon on my store, and soak up some much needed vitamin D for the hard Michigan winter ahead. Nothing like a mini beach vacation! 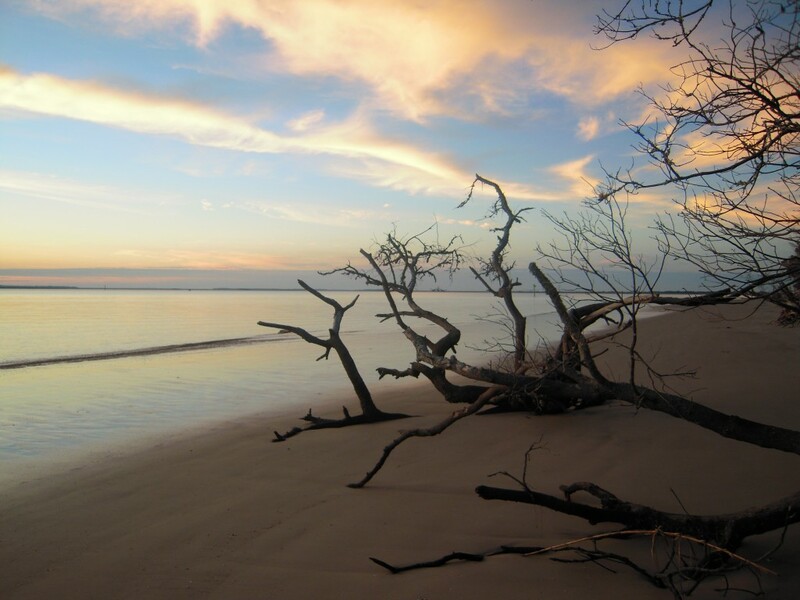 I’m already daydreaming about next years March beach trip! I’m refueled and refreshed and it’s go time for the holiday season! Full speed ahead – tomorrow! What to do when you need a little dessert to go? Pumpkin cupcakes with cream cheese frosting of course! 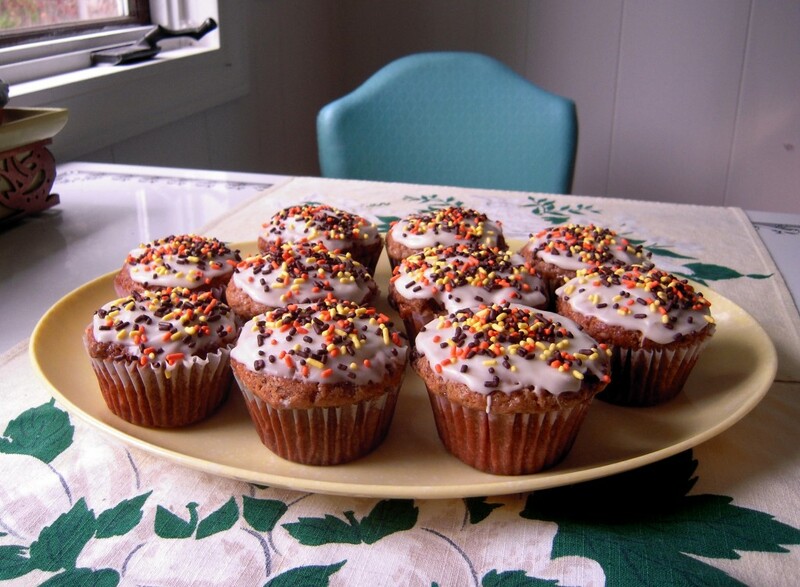 Made with real pumpkin my mom harvested and we added to my freezer for such an occasion. I always make extra to share with friends, and they happen to be just the thing to bring to a lovely dinner last night! I was so pleased to find this lovely bunch of carrots growing away below the surface! 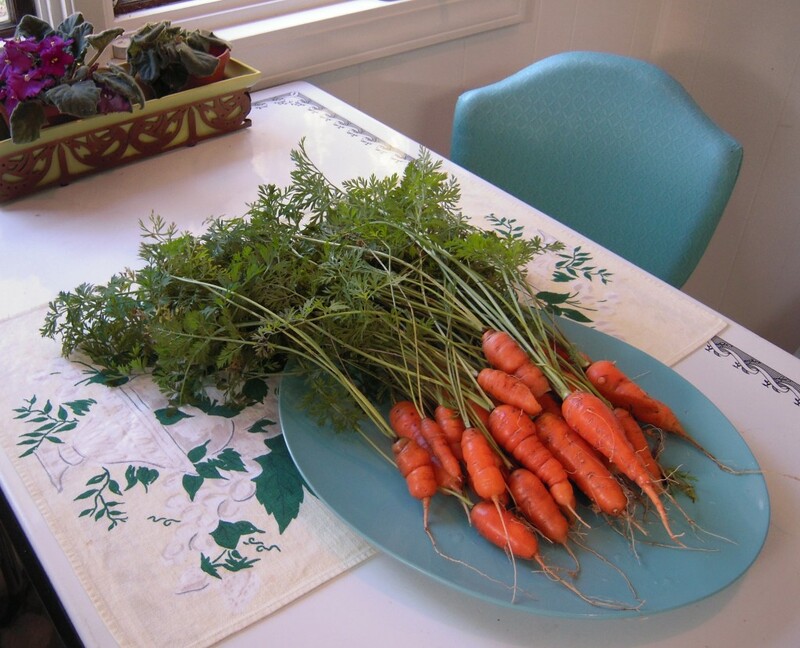 My best carrot harvest yet! I planted them early this Spring and have been waiting for just the right moment to dig them up. I knew it was time when awoke yesterday to find shimmery frosted rooftops. I also harvested some dill and coriander. I’m sad that gardening season is coming to an end but I still have some brave broccoli that will carry on in the cold giving me little bits into the early winter. These tasty carrots are perfect for fall crock pot meals or maybe a delish little carrot cake! Mmmm! Color of the Month! THINK PINK! October happens to be Breast Cancer Awareness Month so it seemed more than appropriate to Think Pink! 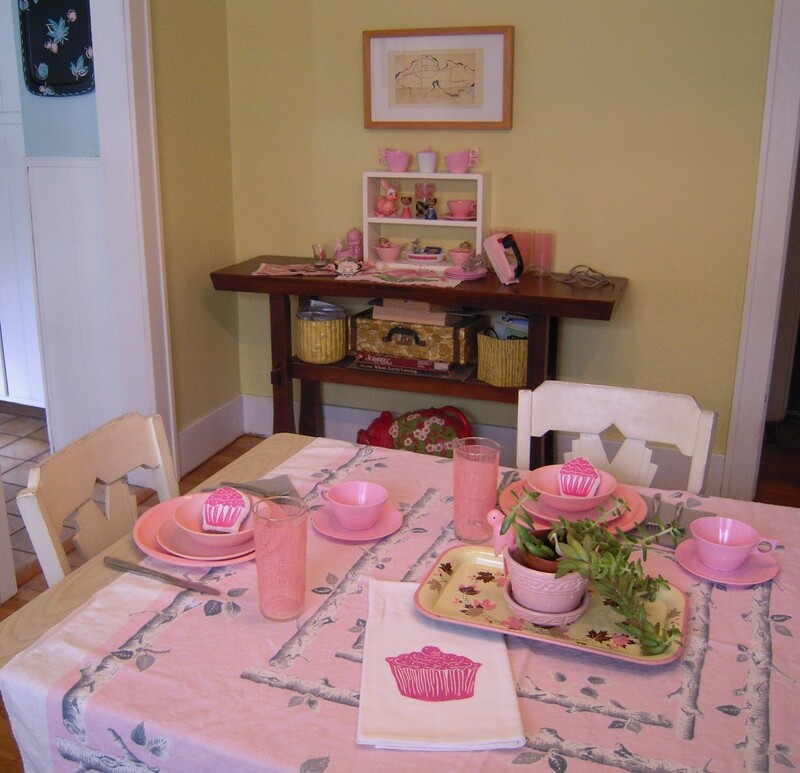 And a pink table setting seems like a perfect excuse to invite some of your best gal pals over for tea and cupcakes! 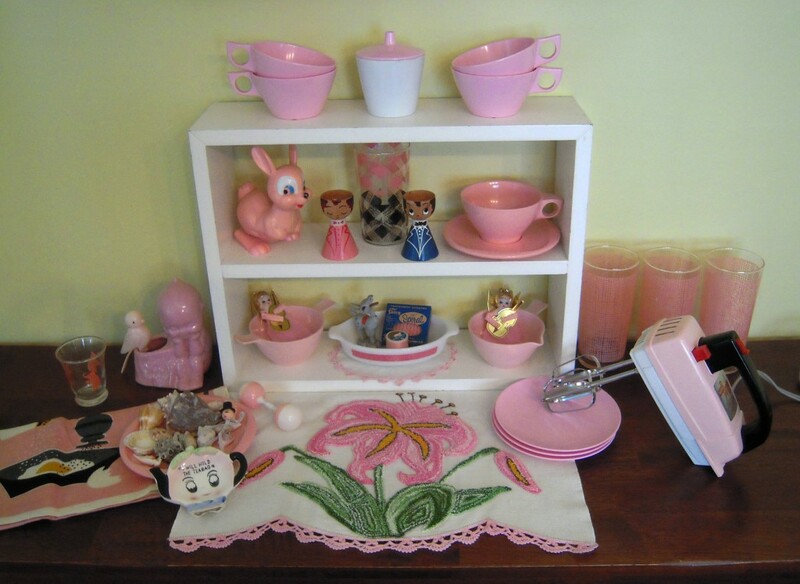 Pink melmac and glassware will be listed soon in my vintagegoodies shop, but sorry folks this fab tablecloth is from my own personal collection! You can however snag an artgoodies cupcake towel! MMM… a fat free, sugar free, treat! 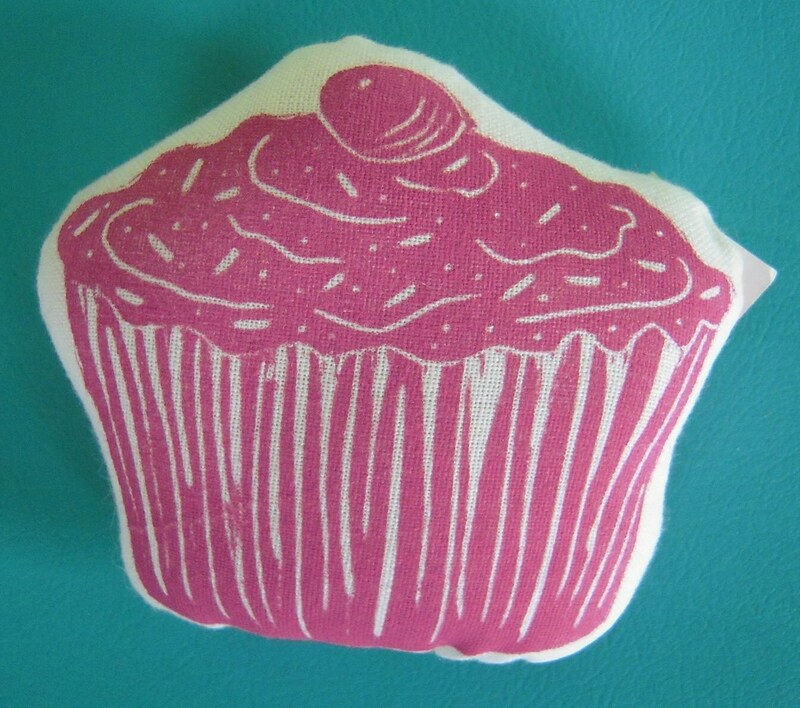 This artgoodies block print stuffie mini pillow is fun for play, a gift basket, or hangin about the office! And this one happens to be on sale simply because I think you deserve a treat! Sometimes you just want to have more than one cupcake! 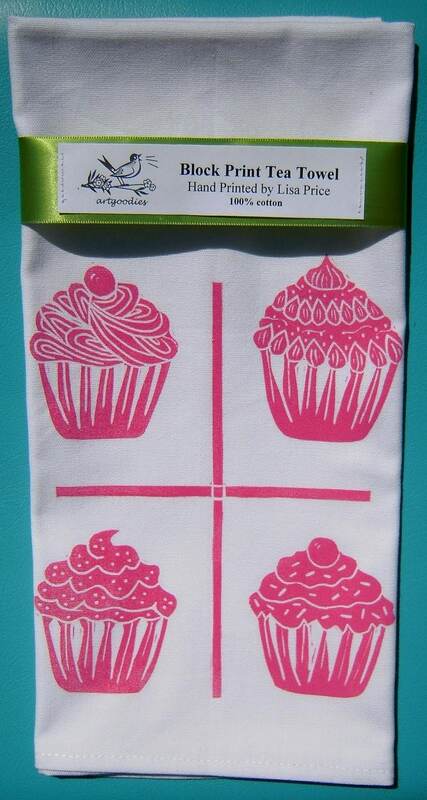 Satisfy your craving with my artgoodies block print mini cupcake tea towel! Here’s a fantastic set of vintage melmac! 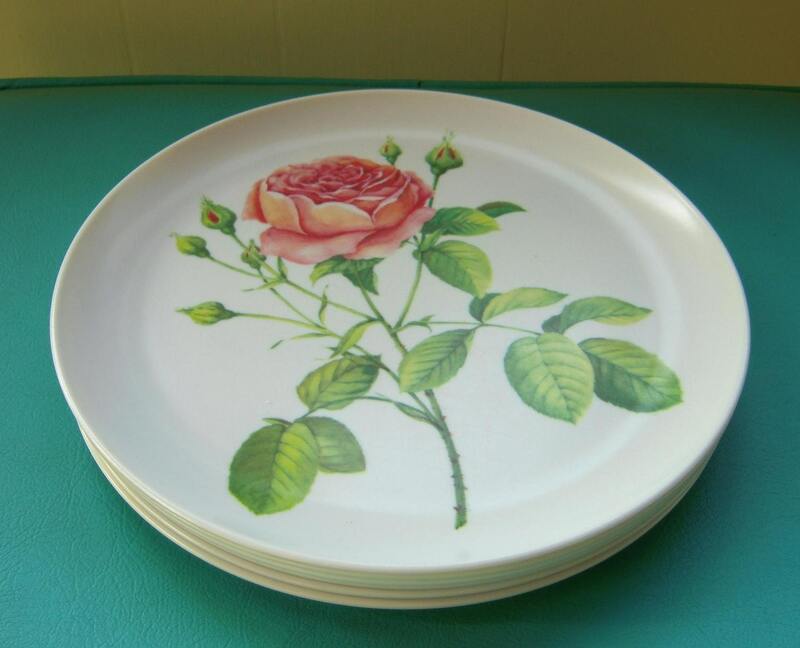 The pink rose design is a stunner and would right fit into your vintage or shabby chic decor!